What would be the outcome of an entrepreneur and a Guinness record holder adventurer? fun, hard work and impact. 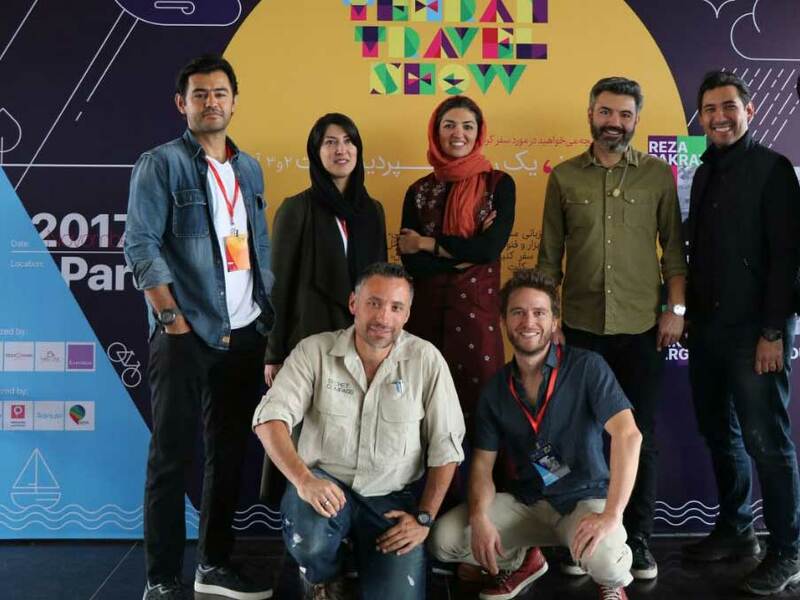 I’m writing this article because we have just finished organizing the first but not the last Tehran Travel Show event series, and I can wait but to share the whole experience and what I have learned from organizing the event. What can an entrepreneur learn from working with an adventurer? What types of challenges might you face? And what was the purpose of organizing this event? But first, let me give you a bit more information about the event if you haven’t heard of already! Tehran Travel Show was an inspiring multimedia event, organized at 23rd and 24th of November 2017, at Pardis Mellat, Tehran. The event purpose was to give it’s audience the tools and know-how as well as the confidence to travel like an expert. Participating in the lectures and workshops gave the audience the skills and knowledge of how to get around obstacles such as visa, time, language barrier, money and open your eyes to the world of possibilities and boost your confidence. They say your best memories are found within the pages of your passport. We all have good and bad ones to share about the places we have been to. A number of professional adventurers converged in Tehran to show enthusiasts the ways they can plan memorable trips. Watch PRESS TV correspondent Hamid Javani report about the event. The whole journey started when I met one of my extraordinary friends in Tehran. Listed amongst the world’s top 20 most seasoned travelers by Men’s Fitness magazine Reza Pakravan is an adventurer, writer, and producer of adventure travel films. He holds the Guinness World Record for crossing the Sahara desert by bicycle: his preferred mode of transport. He told me that there are a handful of people contacting him and ask basic to professional questions about adventure travel and to my ears it was an “opportunity” knowing we can find all pieces of the puzzle to create not just an event, series of events, or initiative, but a movement to inspire people to go exciting places! As an active member of Iran’s startup ecosystem, I have had the chance of accompanying more than 10 startups, some are among the leading startups of Iran today, and some failed of course… Also, I have been lucky enough to organize some great events in Tehran. I look into organizing an event in exactly the same way. It’s exactly the same thing, in a smaller scope. The negotiations, partnerships, time to market, sales, the idea and purpose, branding, I can see a lot of similarities, especially if you know my style which is always bootstrap, meaning I don’t spend a penny for my events up front. And I always say if you can organize a good event in Tehran, you can do anything! 1. They both work hard and don’t complain. For entrepreneurs and professional traveler, working hard and taking responsibility go hand in hand. I can attest to this firsthand: from late nights cranking with my team to endless afternoons of tough negotiating, staying energized while working long hours (some of which can be tumultuous and unrewarding) is just a part of the job. I quickly learned in both traveling and startup life if you’re not excited by the work, you won’t be fueled by the thrill of it. Professional travelers and entrepreneurs both feed off the excitement and work hard. 2. They both are not afraid of failure. Being resourceful and moving swiftly comes in handy whether you’re an adventurer or running a your business. It’s both mental and physical. When growing a business, it’s about making astute observations and deciding quickly, oftentimes with little guidance or feedback on approach. Being able to pivot on a dime is a quality that gets you far and evolves business strategies. 4. They both take care of those who follow them. Fans, customers, teams–winning is rarely a solo effort, so knowing where to give credit when it’s due is key. 5. When competition is a healthy motivator. Competition may not motivate everyone, but I’ve found that the pressure of others’ excellence can be the nudge needed to excel even further. My fellow adventurers are the perfect example of how a bit of healthy competition can inspire greatness. When they skated harder, so did I. In the office, it’s really not all that different. The possibility of being the next big thing is as exciting — and motivating — as completing an expedition. 6. They both push through obstacles. Whether you are in an expedition or aggressive growth goals, learning to never hesitate when it comes to overcoming obstacles, is important. In adventure traveling and business, you must forcibly push right through no matter what. With both adventurers and entrepreneurship, there’s beauty in the triumph. Happy New Year 2018, Here is our Activity Report!